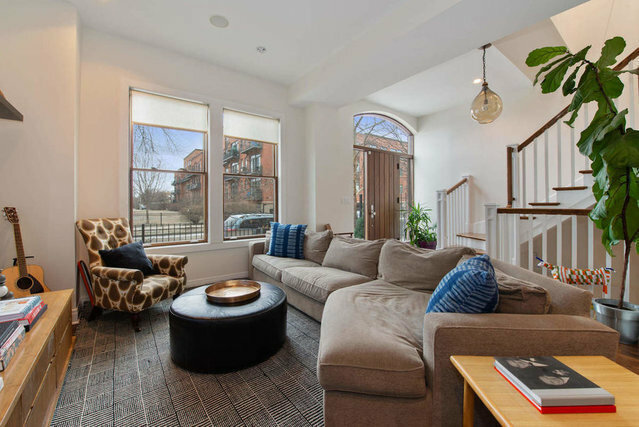 Nothing else like this Bucktown workman's cottage w/ modern finishes. The original brick facade was restored while the home was gut-rehabbed including new foundation. 2RZ Architects designed the custom home w/ kitchen & baths by Vesta. Don't miss the newly installed banquette dining w/ loads of storage designed by nearby Studio Gild. 3 bedrooms up w/ a master suite including impeccably designed shower/bath combo & huge walk-in closet. Laundry room is on the 2nd floor down the hall from the 2 additional beds & bath. The lower level is a beautifully finished 2nd family room w/ full bath. Currently the 4th bed is unfinished & used as a studio but easily converted. The yard with lawn & brick pavers boasts a vegetable & herb garden by The Organic Gardener. Unbelievable opportunity to build next door through the shared wall (see MLS 10273682). Double lots in this part of Bucktown are once a decade. Architectural plans for the build available upon request.